In early 2004, just as The Journey Church in New York City was breaking through the 500-person growth barrier, lead pastor Nelson Searcy received a unique invitation from his friend and mentor Rick Warren. Rick asked Nelson if he would be willing to teach on Church Planting at Saddleback’s annual spring conference. Rick wanted Nelson to detail everything he knew about starting a church from scratch and launching large. If Nelson agreed, he would be given six hours over three days to train the four hundred eager pastors who would be in attendance. Humbled and excited (but not sure he could pull it off), Nelson said yes – and then kicked into high gear with prayerful planning and preparation. One week before the conference, Nelson received a phone call that changed everything. The conference schedule had been shifted; instead of six hours of teaching time, he would only have four. Losing those two hours presented a huge challenge – the pastors needed all of the information he had been prepping, but now there just wasn’t enough time to present it thoroughly. Well, as Plato once said, “Necessity is the mother of invention.” Rather than cutting any of his material, Nelson made the providential decision to record the content he wouldn’t be able to teach live and give it to the participants on CD. Am I Called to Be a Church Planter? Maybe it was a crazy idea, but it worked! The conference was a success. Shortly after, calls and emails began pouring into Nelson’s office from people wanting to know where they could buy copies of the four CDs he’d handed out. One call came from the leader of another large church planting conference, who wanted to offer the CDs to his attendees later that year. Due to the high demand, Nelson started making his resources available for purchase at various conferences, at his own personal speaking events and on his website. With that, Church Leader Insights (CLI) was born. Since 2004, Nelson has developed over one hundred church growth resources – each just as practical, proven and well received as those first four. Church Leader Insights now impacts over 90,000 church leaders every year. Nelson’s continued mission is to help church leaders around the world cooperate with God in creating healthy, thriving churches. The proceeds generated through the sale of Nelson’s resources allow the ministry to continue operating and to provide certain training materials (like podcasts, webinars and e-books) for free. Today, in an effort to make information and training available to leaders everywhere, Nelson regularly gives away thousands of dollars worth of books, international downloads, and additional audio resources through CLI. One ministry leader recently estimated that Nelson blesses over 3,000 church leaders around the globe with over $45,000 in free resources every single month. God is good! One of Nelson’s primary goals has always been, and continues to be, to give those who invest in his resources far more value for their money than expected. And it seems to be working – Church Leader Insights is currently expanding at the rate of 500 new church leaders every week. After leading CLI for several years and equipping tens of thousands of pastors to develop healthy systems to lead their churches to growth, a timely conversation with one of his coaching alumni encouraged Nelson to expand his influence on pastors beyond the walls of the church and into living a healthy, God-honoring life in all aspects, including their personal life. 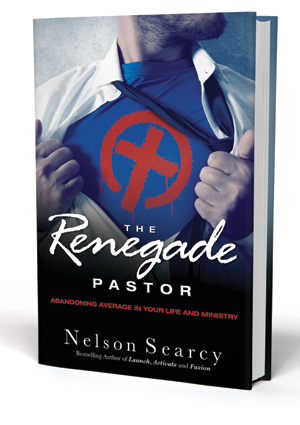 This renewed focus on the personal life of pastors led to the creation of the Renegade Pastors Network (RPN) in early 2012 – a network designed to help pastors abandon average and strive for God’s best in their personal lives AND in their ministry. Within months it was obvious that pastors were hungry for this new opportunity, and membership continues to increase every week. Membership in the RPN gives pastors access to Nelson each month, as well as other prominent authors and church leaders through monthly conference calls and live events, not to mention other free and discounted resources (only available to RPN members). An experienced strategist, coach and speaker, Nelson serves as a regular consultant to churches around the world – including many of the largest and fastest growing churches in the United States. Nelson received his BA/BS from Gardner Webb University and his Masters of Divinity from Duke University. He has pursued additional studies at North Carolina State University, Southeastern Baptist Theological Seminary, Gardner-Webb University School of Divinity, Fuller Theological Seminary, and Southern Baptist Theological Seminary. After becoming a Christian in college, Nelson entered full time ministry in 1990. He pastored churches in North Carolina and served with the Baptist State Convention of North Carolina from 1990 to 1999. In 1999, Nelson went on staff with Rick Warren at Saddleback Church in Southern California. There, he was the founding director of the Purpose Driven Community, guiding more than 5,000 member churches. He was also a key architect for Warren’s PurposeDriven.com. In 2001, Nelson and his wife, Kelley, moved to New York City to launch The Journey Church of the City – an innovative, multicultural church in the heart of Manhattan. Since its start in the spring of 2002, The Journey has grown from a handful of attendees to over 1,100 people in Sunday worship services with more than 1,200 people active in small groups. The church currently has additional locations in Queens (NY), Staten Island (NY), San Francisco, CA, and Boca Raton, FL. Known for its combination of growth and effectiveness, The Journey continues to thrive in environments that are less than conducive to new church development – a testament to God’s power and Nelson’s understanding of the essential principles of church growth. Nelson is also a member of the National Association of Evangelicals (NAE).